About seven years ago I spent a week or so getting to know Houbigant's 2004 flanker, Quelques Fleurs Royale. It didn't work out, as my old (and somewhat embarrassing review shows). I wish I had a sample now to see how I'd feel about Royale after all these years. 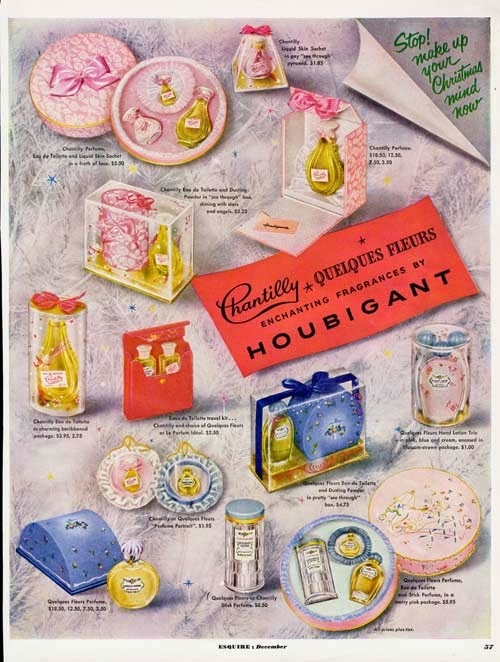 At the time I wasn't familiar with other Houbigant perfumes (back then I attributed Chantilly to Dana), and it was a while before I smelled several versions of the original Quelques Fleurs and realized I actually do enjoy the real thing. I was on a search for a while until I finally came across a pristine vintage bottle in an estate sale. It was still in its blue box with the basket of flowers, exactly like the one you see in the top picture. The ads above date from 1948 and 1951, but I'm pretty sure my bottle can't be quite as old- it's most like from the 60s, which is still impressive considering how alive and lively the juice smells. Quelques Fleurs was created and launched in 1912 (you can read about the fascinating history of Houbigant and its perfumes on Ca Fleure Bon). This predates most of the classic floral perfumes I've ever known and was obviously an influence on just about all of them. Think of it: Chanel No.5 (1921) is credited as one of the very first abstract floral fragrances- a scent that is not a soliflore and is not specific, but as Gabrielle Chanel intended- it smells man-made and not like something plucked right out of the garden. 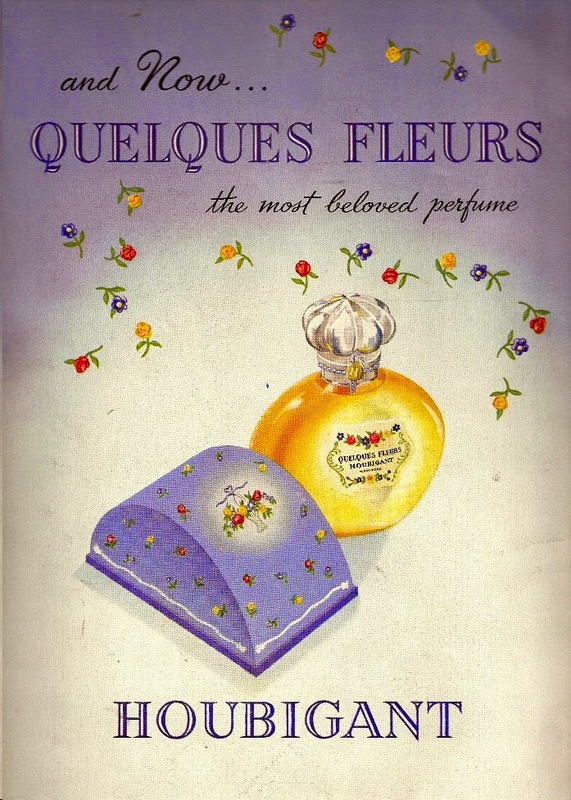 But Quelques Fleurs with its assorted floral notes was among the very first to use synthetic molecules that recreate notes such as muguet, orchid, and lilac which are extremely hard to produce naturally for commercial use. And they're all there. Every small and delicate flower in imaginary cottage garden in the early spring, with swarms of white and yellow butterflies that flutter all over the place. It's a thing of beauty, nostalgic, innocent, yet just womanly enough not to be boring. I no longer remember why I was so annoyed with the modern flanker of Quelques Fleurs, but I'm pretty sure it didn't smell anything like this, because the sweet lilac, hyacinth, and honeysuckle here are heartbreaking in their fragile beauty. It's like finding small, extremely pretty and completely genuine little bits and pieces at an antique market: handmade lace, a perfect delicate china cup with a long forgotten pattern, a turn-of-the century photo of a nameless beautiful family. The beauty of the ordinary items touches you through the decades as it does in this classic Houbigant perfume. We don't live like that anymore, but we can smell the part, at least for a day. Houbigant in its current incarnation still makes Quelques Fleurs ($100, 1 oz EDP at Neiman Marcus). I'm not sure how close it is to the vintage perfume reviewed here. This was one of the perfumes I used to adore. I'm sure the current version is nothing like the vintage. Now I want it! "Every small and delicate flower in imaginary cottage garden in the early spring, with swarms of white and yellow butterflies that flutter all over the place." What a beautiful image you describe. Have you ever watched the PBS Masterpiece show, "Mr. Selfridge"? It is about Selfridges in London in the 1910's. They have many scenes in the beauty department with lots of beautiful vintage bottles of perfume. I just love that old world packaging ----- I really think if someone brought that back it would sell like hotcakes!! I would market it as "Shabby Chic" and it is!!! I loved this perfume the first time I smelled it in a friend's collection, around 1980, and a dozen years later convinced a sweetheart to buy me a bottle -- it wasn't the same. I didn't know about reformulations then and kept wondering if I'd hallucinated the beautiful scent I remembered, which must have been an earlier iteration. It was enchanting indeed.